When a team of Silicon Valley-based education experts launched a new think tank, they needed a brand identity that would stand out in a crowded field of education research organizations. True to their belief in the power of research, the team commissioned communications research to create a brand identity that would resonate with an audience of policymakers and influencers. Conversations with funders, practitioners and policymakers identified a key differentiator to set the new think tank apart in the field. Dozens of organizations produce research on education, but much of it never leads to changes in public policy and classroom practices. “Our name indicates a distinct perspective in which we place learning at the center of our attention,” wrote President and CEO Linda Darling-Hammond in a piece announcing LPI’s launch. The newly christened think tank also needed a visual identity with elements that felt familiar enough to “fit” within the space but unique enough to differentiate it from the pack. After analyzing the landscape, we worked closely with the LPI team to develop a new logo, color palette, fonts and other visual elements. 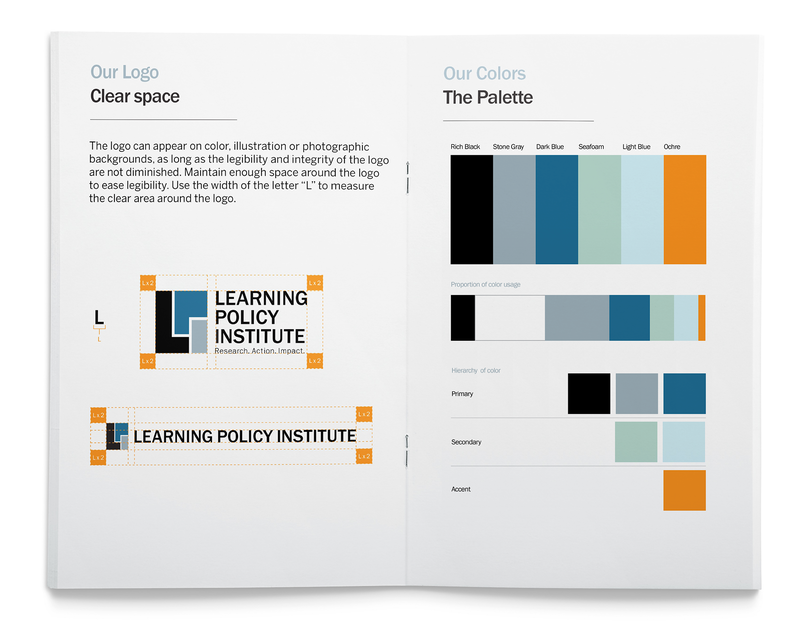 We packed all of these elements into a Visual Identity Guidebook, which serves as a comprehensive reference that helps staff across the organization adhere to their memorable and cohesive brand.